Poets: Bashō. Beverly Acuff Momoi. Buson. Claire Gallagher. Hosai Ozaki. Ki no Tsurayuki. Marianna Monaco. Ouzel (James Arnold). Patricia Donegan. Patricia J. Machmiller. Renée Owen. Shiki. Comparison of Oseko and Reichhold translations. Other info on Matsuo Bashō: Haiku. Haibun. Renga. Time Line. 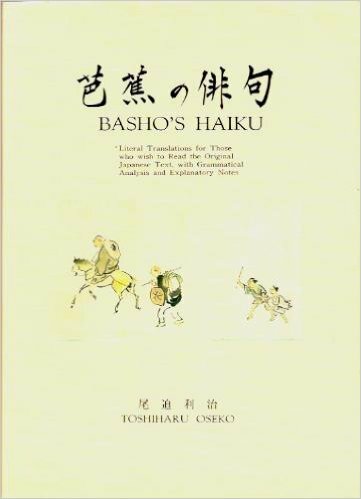 Toshiharu Oseko has published two remarkable volumes of Basho's Haiku: Literal Translations for Those Who Wish To Read the Original Japanese Text, with Grammatical Analysis and Explanatory Notes. The first volume appeared in 1990 and the second in 1996, published in Tokyo: Maruzen. The first (1990) volume of Oseko's translations is available in the West. The second can be seen in some university libraries. The pair together are one of the best books read in 2016. The first (1990) volume has 330 of the better-known haiku, a full page per haiku. The second (1996) volume the other 649 haiku, a half page per haiku. The Japanese as originally written (kanji and hiragana characters). The romaji pronunciation of the Japanese poem. Word-by-word translation of the Japanese, including descriptions of word alterations between Bashō's Japanese and modern Japanese. This is especially useful for verb forms and is helpful for adjectival changes. Vol. 1 contains special sections on grammar. Notes on the cultural context. These are rich and include historical events relevant to each haiku, thus adding meaning that might be intuitive to the Japanese but would otherwise escape most Western readers. Oseko's annotations, a powerful complement to his translations, are fascinating. My only criticism of Oseko's translations is that they contain considerably more punctuation than a native English speaker would use. Jane Reichhold published her volume of Basho: The Complete Haiku. Published 2008 with 1012 haiku, typically six haiku per page. Year and season when she thought the haiku was written. Word-by-word translation of the Japanese. Notes (usually two to ten lines) on the cultural context and sometimes with additional information about the style of the poem. An informative twelve-page Appendix identifying and discussing 33 types of haiku technique. Because of the richness of Oseko's annotations and the generosity of his translations, I recommend him strongly over Reichhold for someone wanting to study all of Bashō's haiku in a deep context of Japanese culture. Unfortunately Oseko's first (1990) volume is rare and expensive in the West. The second can be even harder to find. Both can be seen in some university libraries. Bashō the Professional Poet 1675-79. A Retreat to Nature — A Religious Life 1680-83. Bashō's Journeys in the Way of the Poet 1684-88. Bashō's Journey to the Interior 1689. At the Peak and Still Traveling 1690-91. Bashō Finds the Secret of Greatness in Poetry and Life 1692-94. 179 pages devoted to commentary, literal translations, Romanized versions, and original Japanese. 12 pages devoted to haiku techniques. 2 pages for a selective chronology of the life of Matsuo Bashō. 10 pages for a Glossary of Literary Terms. 8 pages for an Index of First Lines (in Reichhold's translation). In parallel with reading Oseko, I checked every one of Reichhold's corresponding translations. Sometimes Reichhold's are better poetry. But sometimes she takes liberties that seem to limit or redirect the meaning. Oseko, a modern native Japanese, probably takes the reader closer to what Bashō intended. While Oseko is my preference, if you cannot get hold of the Oseko volumes, the Reichhold can serve. If you are looking for most poetic translations of Bashō, you probably want the (limited number of) translations by a third translator — Barnhill. Both Oseko and Reichhold have close to 1,000 haiku, translated and annotated. Oseko gives "literal" translation of 979 haiku in 2 vols: 330 haiku in first volume; 649 in second volume. 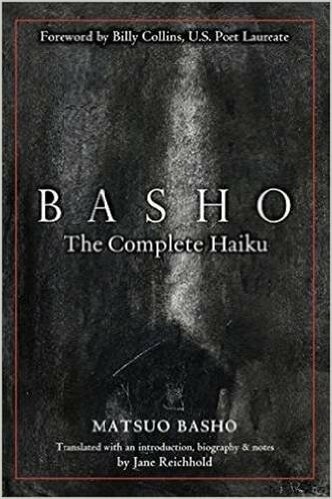 In several cases, he includes two or three versions that Bashō made under a single haiku number; this accounts for the bulk of the slightly larger number of haiku offered by Reichhold. Reichhold translates 1,012 haiku in 1 vol. Book size: the Reichhold book has a slightly smaller cross section than Oseko's and it's much thinner than the sum for Oseko's two volumes. Oseko's 2 vols (Vol. 1 in 1990 then Vol. 2 in 1996) have total size 10.5" high, 7.5" wide, 2.5" thick. Unnumbered pages. Reichhold (2008) gives a single volume: 9.5" high, 6.5" wide, 1" thick. 431 pages. Organization: both are chronological within each volume. Oseko puts the better known haiku in his Volume One and the less-known poems in Volume Two. Their sequences differ in many details. Sometimes that is because Oseko attributes many more haiku than does Reichhold to a window of uncertainty. Commentary placement: Oseko's notes are on the same page as the haiku, which is very helpful. Reichhold's notes are in a separate section: this causes extra work that can irritate a reader who must flip between sections to read and integrate the commentary. Commentary contents: Oseko's commentaries are rich and detailed. Reichhold's book appeared 18 and 12 years after the two Oseko volumes. Fairly often, her comments on a haiku seem like a subset of Oseko's. Notes: Shirara, Ochikubo, and Kyoutarou are the names of soushi [storybooks] mentioned in ... Lady Joururi Monogatari. There is a passage in the chapter of Sugatami: "Which did she read, Kokin, Manyou, Ise-Monogatari, Shirara, Ochikubo or Kyoutarou?" This haiku depicts the scene of a beautiful girl like Lady Joururi reading the year's first soushi [storybook] near the ume blossoms. The three last words of the poem, shirara, ochikubo, and kyoutarou, are titles of children's books. Many other comparisons of the translators' notes show Oseko giving marvelous context and Reichhold being helpful but limited. Copyright © 2016-2016 by J. Zimmerman, except for the quoted poems.